This book is not a collection of recycled ideas about body language. It does not suggest that a woman��s hairstyle will give us unprecedented access into her soul, neither does it draw wildly ambiguous generalities about people based on our intuition or gut instinct, nor does it reach conclusions based on how she folds her hands or he ties his shoelaces. This book contains specific, practical, and proven, psychological techniques that you can use to know a person��s thoughts and feelings at anytime--often within minutes. Because the techniques can be applied instantly to any person in just about any situation, Dr. Lieberman has demonstrated their ease and accuracy on hundreds of television and radio programs. In a special report for FOX News, host Jeff Rosin declared, ��It��s simply amazing! I was with him and he was never wrong . . . not even once. I even learned how to do it and that��s saying something.�� In fact, Dr. Lieberman has gone ��head-to-head�� on live television, with skilled polygraph examiners and scored just as well��every time. You Can Read Anyone shows step-by-step exactly how to tell what someone is thinking and feeling in real-life situations. And when the stakes are high��negotiations, interrogations, questions of abuse, theft, or fraud-- knowing who is out for you, and who is out to get you (or a loved one) can save you time, money, energy, and heartache. The New York Times put it best. In a feature article they simply said, ��Don��t lie to David Lieberman��. And now you too, can learn the most important psychological tools governing human behavior and do more than just put the odds in your favor. Set up the game so that you can��t lose. A peak at what you'll learn: THE ULTIMATE BLUFF BUSTER: How would you like to know if the guy sitting across the poker table from you really has a full house or just a pair of deuces? Or if your top executive is serious about quitting if he doesn't get a raise? Find out if your opponent is feeling good about his chances or just putting up a good front dead giveaway a poker player is bluffing /sure fire sign good hand, even pros give themselves away IS THIS PERSON HIDING ANYTHING? Don't get the wool pulled over your eyes! The next time you have a "sneaking" suspicion, that someone may be "up" to something, casually find out if anyone- kids, coworker, spouse, or friend--is keeping something from you Alibi Tester IS HE INTERESTED OR ARE YOU WASTING YOUR TIME? If you want to find out if your date likes you or not; if your co-worker is really interested in helping you with your project; or if your prospect is interested in your product, learn how to know, every time. WHOSE SIDE IS SHE REALLY ON? Is she out for you, or to get you? If you think that someone may be sabotaging your efforts, when she appears to be cooperating, find out whose side anyone is on, and fast. EMOTIONAL PROFILE: Learn the signs of emotional instability and potential for violence. From a blind date to the baby-sitter to a coworker, know what to look for, and what questions to ask, in order to protect you and your loved ones. David J. Lieberman, Ph.D., is an award-winning author and internationally recognized leader in the fields of human behavior and interpersonal relationships. Techniques based on his six books, which have been translated into twenty languages and include two New York Times bestsellers, are used by the FBI, The Department of the Navy, Fortune 500 companies, and by governments, corporations, and mental health professionals in more than twenty-five countries. Dr. Lieberman whose work has been featured in publications around the world has also appeared as a guest expert on more than two hundred programs such as: The Today Show, Fox News (Fox & Friends, The O��Reilly Factor), CNN, NPR, BBC, The Montel Williams Show, and The View. This book is unorganized and hard to follow. Here and there, there are interesting ideas but some of them are not explored sufficiently. For example the author brings up "Eye-Accessing Cues" at the end of chapter 4 which is very important but he only writes a few simple paragraphs on the issue which is not enough. IT IS A MUST HAVE HE WILL MAKE YOU SEE PEOPLE DIFFERANTLY . Don't buy this book if you really want to learn about this stuff. This is yet another "buy-this-to-get-the-secrets" book aimed at corporate America, exploiting that mainstream desperate, competitive edge. But when examined closely, this book really doesn't give you any helpful tools to use in the social arena of reading others' sincerity; it is anecdotal, non-rational, and provides examples that are too narrow and templative to provide a deductive understanding of this concept. There are no photos at all, only insets of anecdotal fictions used to describe what the author says you should do. It amounts to an poser's list of conversational phrases and maneuvering tactics to bludgeon out responses from other people, and will just make you look like the confrontational equivalent of a Stephen Covey geek. If you really want to learn how to perceive non-verbal stress, self-doubt, insecurity, etc., if you want to learn the *gestures* that exhibit these things, buy the book "What Every Body is Saying: An Ex-FBI Agent's Guide to Speed-Reading People." It is full of photos and it describes the underlying instincts causing all of them. Needless to say, it also has a more substantial and academic bibliography. One of the top 10 self help books ever! I have never reviewed a book before but I am so struck and disturbed by the cattiness and vindictiveness of Jen's "review" of a book, she admits to never reading,that I am writing my first one. Well, it feels like i do after reading David Lieberman's "You can read anyone". It was such riveting reading that i couldn't put it down for a whole week reading the pages over and over again to see if i missed out on any new information. I love the theory followed by example format which was chosen and even tested some examples in real life. Whilst i cannot say it works 100% of the time, i find it still very compelling to read and try out. Its funny to see that sometimes human behaviour can be so predicable. I enjoyed this book. Thought it had some useful tidbits, but I wouldn't say that it could be easily applied in every situation. I think you'd have to practice and know your "audience", before applying some of his logic. After reading this book, I know I've had someone apply one of these principles to me at one time. I'm a fairly open person and I wish they would've come right out and asked me instead of me "reading them" and what they were trying to get at. Of course, not everyone is as open, so these tips may help in discovering another person. While there are some gems in this book, they are pretty darn sparse. It seems more like a self-promoting book on his "SNAP" method. I could care less, and you'll likely feel the same after reading this book. It starts with really weak routines to glean information. Some are OK, but overall the system needs a lot of work. As soon as he suggested listening to recordings of people speaking played backward in order to listen to the subconscious mind, I was out of there! I'll likely return this book which claims to be a science, but is more a self-promoting new age religion that at best is marginal, and at worst will anger people, and make them feel used. Hardly a rapport building philosophy, or a way to get to the truth in most cases. I am giddy from this book. I think it's important to know exactly what you can do with these tools. So the entire table of contents is below with a asterick by my favorites! Also, a little about how the book works is added too. Not all of the technqiues are easy to use, but most are. Some admitingly go a little over my head, but my boss seems to have figured them out. Anyway, plenty here for even us average folks! friends--is keeping something from you. his chances or simply putting up a good front. indication of thought, attitude, and behavior. thought and the role of the ego. making process and how it shapes our reality. or Is He Just Pretending? who is simply full of himself (big ego). how much self-esteem another person really has. and on his life, based upon the three major profiles. of human nature with real-life examples. variety of observational and conversational techniques. or unforgiving when he finds out an unpleasant truth. This book will open your eyes with a few techniques in non-verbal communication. The objective of the book is to keep you from being manipulated....But, the opposite is also true. How to understand people better than they understand themselves!!! "As the only one of its type, this program [or system outlined in this book] offers a complete, practical, easy-to-use system that you can use to measure a person's thoughts and feelings quickly, at any time." The above quotation is found in the introduction of this fascinating book by Dr. David J. Lieberman, author and "internationally recognized leader" of human behavior and interpersonal relationships. Be aware that the system in this book is not about reading someone based on their body language, their speech pattern, or how they dress. It is not about developing some mystical power such as telepathy. 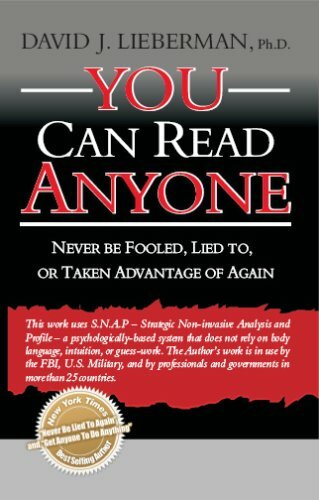 Instead, this book contains specific and proven psychological techniques that can be instantly applied to any person in almost any situation. Is this system absolutely foolproof? Of course not. No system is. But you will gain a "statistical advantage" to reading a person by using the methods in this book. (1) Is this person hiding anything? (2) Does the person like or not like someone or something? (3) Is the person really confident or just attempting to play it cool? (4) How is a person really feeling? (5) Is the person really interested or are you just wasting your time? (6) Whose side is a person really on? (7) How safe, stable, and sane is a person...really? Section two (8 chapters), my favorite section, actually goes beyond the basic techniques of section one thus giving you the ability to "peer into someone's mind to find out what [that person] is [really] thinking" and enables you to "understand a person better [than they] understand [themselves]." Don't worry!! Lieberman gives plenty of real-world examples so you'll never be lost. "Once you become...familiar...with what to look for and what to listen to, your ability to read a person will become almost instinctual." In conclusion, besides giving you an effective way of reading people, this book, as well, will most certainly give you a better understanding of human nature and thus more insight into yourself!!! Lieberman writes in a way I think many will enjoy. It's entertaining enough to hold your attention, and yet, provides enough science and documentation to keep it in the educational realm. Like any book that looks to bring social psychology to a wider audience (than just social psychologists!) the author has to find a balance between the technical and the practical. In my opinion, Lieberman does an excellent job of making his expertise accessible. Equally, there is no magic tool when it comes to reading other people, and the reader must work with the structures and concepts Lieberman provides and practice them. The author's style is excellent, with a great balance of examples and explanation that quickly conveys his ideas. You Can Read Anyone makes it on my top ten list of books of all time. This book could very well be called "human nature". You will learn the S.N.A.P. technique used by the FBI, U.S. Military and by professionals and governments in more than 25 countries. David J. Lieberman has a few other books that I will be reading and I'll post a review of those as well. I think it is a 'top seller' because of what it promises not what it delivers. There were some decent common sense examples in the first few chapters. The author only used a few paragraphs to explain how to read somebodies eyes (needs more). The last chapters are somewhat confusing.